Louis Pasteur ( French: ; December 27, 1822 – September 28, 1895) was a French chemist and microbiologist who was one of the most important founders of medical microbiology. He is remembered for his remarkable breakthroughs in the causes and prevention of diseases. His discoveries reduced mortality from puerperal fever, and he created the first vaccines for rabies and anthrax. His experiments supported the germ theory of disease. He was best known to the general public for inventing a method to treat milk and wine in order to prevent it from causing sickness, a process that came to be called pasteurization. He is regarded as one of the three main founders of microbiology, together with Ferdinand Cohn and Robert Koch. Pasteur also made many discoveries in the field of chemistry, most notably the molecular basis for the asymmetry of certain crystals. His body lies beneath the Institute Pasteur in Paris in a spectacular vault covered in depictions of his accomplishments in Byzantine mosaics. Louis Pasteur was born on December 27, 1822, in Dole in the Jura region of France, into the family of a poor tanner. Jean-Joseph Pasteur was his father and Jeanne-Etiennette Roqui his mother. Louis grew up in the town of Arbois. This fact probably instilled in the younger Pasteur the strong patriotism that later was a defining element of his character. Louis Pasteur was an average student in his early years, but he was gifted in drawing and painting. His pastels and portraits of his parents and friends, made when he was 15, were later kept in the museum of the Pasteur Institute in Paris. He earned his Bachelor of Arts degree (1840) and Bachelor of Science degree (1842) at the cole Normale Superieure. After serving briefly as professor of physics at Dijon Lycee in 1848, he became professor of chemistry at the University of Strasbourg, where he met and courted Marie Laurent, daughter of the university’s rector, in 1849. They were married on May 29, 1849, and together had five children, only two of whom survived to adulthood; the other three died of typhoid. These personal tragedies inspired Pasteur to try to find cures for diseases such as typhoid. In Pasteur’s early work as a chemist, he resolved a problem concerning the nature of tartaric acid (1848). A solution of this compound derived from living things (specifically, wine lees) rotated the plane of polarization of light passing through it. The mystery was that tartaric acid derived by chemical synthesis had no such effect, even though its chemical reactions were identical and its elemental composition was the same. This was the first time anyone had demonstrated chiral molecules. Pasteur’s doctoral thesis on crystallography attracted the attention of W. T. Fuillet, and he helped Pasteur obtain a position of professor of chemistry at the Facult (College) of Strasbourg. In 1854, Pasteur was named Dean of the new Faculty of Sciences in Lille. It was on this occasion that Pasteur uttered his oft-quoted remark: “… dans les champs de l’observation, le hasard ne favorise que les esprits prepares” (In the field of observation, chance favors only the prepared mind.) In 1856, he was made administrator and director of scientific studies of the cole Normale Suprieure. Pasteur demonstrated that fermentation is caused by the growth of micro-organisms, and the emergent growth of bacteria in nutrient broths is due not to spontaneous generation, but rather to biogenesis (Omne vivum ex vivo “all life is from life”). He exposed boiled broths to air in vessels that contained a filter to prevent all particles from passing through to the growth medium, and even in vessels with no filter at all, with air being admitted via a long tortuous tube that would not allow dust particles to pass. Nothing grew in the broths unless the flasks were broken open, showing that the living organisms that grew in such broths came from outside, as spores on dust, rather than spontaneously generated within the broth. This was one of the last and most important experiments disproving the theory of spontaneous generation. The experiment also supported germ theory. While Pasteur was not the first to propose germ theory (Girolamo Fracastoro, Agostino Bassi, Friedrich Henle and others had suggested it earlier), he developed it and conducted experiments that clearly indicated its correctness and managed to convince most of Europe that it was true. Today, he is often regarded as the father of germ theory and bacteriology, together with Robert Koch. Pasteur’s research also showed that the growth of micro-organisms was responsible for spoiling beverages, such as beer, wine and milk. With this established, he invented a process in which liquids such as milk were heated to kill most bacteria and moulds already present within them. Claude Bernard and he completed the first test on April 20, 1862. This process was soon afterwards known as pasteurization. In 1865, two parasitic diseases called pebrine and flacherie were killing great numbers of silkworms at Alais (now Ales). Pasteur worked several years proving that these diseases were caused by a microbe attacking silkworm eggs, and that eliminating the microbe in silkworm nurseries would eradicate the disease. Pasteur also discovered anaerobiosis, whereby some micro-organisms can develop and live without air or oxygen, called the Pasteur effect. Pasteur’s later work on diseases included work on chicken cholera. During this work, a culture of the responsible bacteria had spoiled and failed to induce the disease in some chickens he was infecting with the disease. Upon reusing these healthy chickens, Pasteur discovered he could not infect them, even with fresh bacteria; the weakened bacteria had caused the chickens to become immune to the disease, though they had caused only mild symptoms. His assistant, Charles Chamberland (of French origin), had been instructed to inoculate the chickens after Pasteur went on holiday. Chamberland failed to do this, but instead went on holiday himself. On his return, the month-old cultures made the chickens unwell, but instead of the infection’s being fatal, as it usually was, the chickens recovered completely. Chamberland assumed an error had been made, and wanted to discard the apparently faulty culture when Pasteur stopped him. Pasteur guessed the recovered animals now might be immune to the disease, as were the animals at Eure-et-Loir that had recovered from anthrax. Pasteur publicly claimed he had made the anthrax vaccine by exposing the bacilli to oxygen. His laboratory notebooks, now in the Bibliotheque Nationale in Paris, in fact show Pasteur used the method of rival Jean-Joseph-Henri Toussaint, a Toulouse veterinary surgeon, to create the anthrax vaccine. This method used the oxidizing agent potassium dichromate. Pasteur’s oxygen method did eventually produce a vaccine but only after he had been awarded a patent on the production of an anthrax vaccine. The notion of a weak form of a disease causing immunity to the virulent version was not new; this had been known for a long time for smallpox. Inoculation with smallpox was known to result in far less scarring, and greatly reduced mortality, in comparison with the naturally acquired disease. Edward Jenner had also discovered vaccination, using cowpox to give cross-immunity to smallpox (in 1796), and by Pasteur’s time this had generally replaced the use of actual smallpox material in inoculation. The difference between smallpox vaccination and anthrax or chicken cholera vaccination was that the weakened form of the latter two disease organisms had been “generated artificially”, so a naturally weak form of the disease organism did not need to be found. This discovery revolutionized work in infectious diseases, and Pasteur gave these artificially weakened diseases the generic name of “vaccines”, in honour of Jenner’s discovery. Pasteur produced the first vaccine for rabies by growing the virus in rabbits, and then weakening it by drying the affected nerve tissue. The rabies vaccine was initially created by Emile Roux, a French doctor and a colleague of Pasteur who had been working with a killed vaccine produced by desiccating the spinal cords of infected rabbits. The vaccine had been tested only on 11 dogs before its first human trial. This vaccine was first used on 9-year old Joseph Meister, on July 6, 1885, after the boy was badly mauled by a rabid dog. This was done at some personal risk for Pasteur, since he was not a licensed physician and could have faced prosecution for treating the boy. After consulting with colleagues, Pasteur decided to go ahead with the treatment. Meister did not contract the disease. It is sometimes said that Pasteur saved the boy’s life, but this cannot be maintained with certainty, since the risk of contracting rabies after such an exposure is estimated at around 15%. Nonetheless, Pasteur was hailed as a hero and the legal matter was not pursued. The treatment’s success laid the foundations for the manufacture of many other vaccines. The first of the Pasteur Institutes was also built on the basis of this achievement. In 1995, the centennial of the death of Louis Pasteur, the New York Times ran an article titled “Pasteur’s Deception”. After having thoroughly read Pasteur’s lab notes, the science historian Gerald L. Geison declared Pasteur had given a misleading account of the preparation of the anthrax vaccine used in the experiment at Pouilly-le-Fort. Max Perutz published a vigorous defense of Pasteur in the New York Review of Books. Maurice Vallery-Radot, grandson of the brother of the son-in-law of Pasteur and outspoken Catholic, also holds that Pasteur fundamentally remained Catholic. According to both Pasteur Vallery-Radot and Maurice Vallery-Radot, the following well-known quotation attributed to Pasteur is apocryphal: “The more I know, the more nearly is my faith that of the Breton peasant. Could I but know all I would have the faith of a Breton peasant’s wife”. 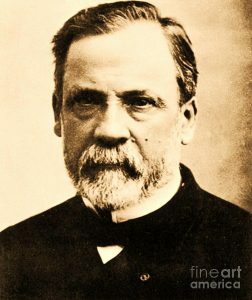 According to Maurice Vallery-Radot, the false quotation appeared for the first time shortly after the death of Pasteur. However, despite his belief in God, it has been said that his views were that of a freethinker rather than a Catholic, a spiritual more than a religious man. He was also against mixing science with religion. Pasteur’s death occurred in 1895, near Paris, from complications of a series of strokes that had started in 1868. He died while listening to the story of St Vincent de Paul, whom he admired and sought to emulate. He was buried in the Cathedral of Notre Dame, but his remains were reinterred in a crypt in the Institut Pasteur, Paris, where he is remembered for his life-saving work. Pasteur won the Leeuwenhoek medal, microbiology’s highest Dutch honor in Arts and Sciences, in 1895. Both Institute Pasteur and Universite Louis Pasteur were named after him. He was made a Knight of the Legion of Honour in 1853, promoted to Commander in 1868, to Grand Officer in 1878 and made a Grand Croix of the Legion of Honor one of only 75 in all of France – in 1881. On June 8, 1886, the Ottoman Sultan Abdul Hamid II awarded Pasteur with the Order of the Medjidie (I. Class) and 10000 Ottoman liras. In many localities worldwide, streets are named in his honor. For example, in the USA: the medical school at Stanford University, Palo Alto and Irvine, California, Boston, Massachusetts and Polk, Florida, adjacent to the University of Texas Health Science Center at San Antonio; Jonquiere, Quebec; San Salvador de Jujuy and Buenos Aires (Argentina), Great Yarmouth in Norfolk, in the United Kingdom, Jericho and Wulguru in Queensland, (Australia); Phnom Penh in Cambodia; Ho Chi Minh City in Vietnam; Batna in Algeria; Bandung in Indonesia, Tehran in Iran, adjacent to the Odessa State Medical University in Odessa, Ukraine; Milan in Italy and Bucharest, Cluj-Napoca and Timisoara in Romania. A large university hospital is named after him in Koeice, Slovakia. In his honor, a statue of him located on the campus of San Rafael High School in San Rafael, California. Also, there is a Pasteur institute in Ootacamund, a hill station in south India, which is involved in vaccine trials and also rabies diagnosis. A bronze bust of Pasteur resides on the French Campus of Kaiser Permanente’s San Francisco Medical Center in San Francisco, California. The sculpture was designed by Harriet G. Moore and cast in 1984 by Artworks Foundry. In 1992 the Save Outdoor Sculpture! program surveyed the work and described it as being well maintained. Avenue Louis Pasteur in the Longwood Medical and Academic Area in Boston, Massachusetts is named in his honor in the French manner with “Avenue” preceding the name of the dedicate. The Lycee Pasteur in Neuilly-sur-Seine is named after him.